Natasha “Tash” Zelenka loves two things; her “dead literary boyfriend” Count Lev Nikolayevich - or, fondly known to Natasha - “Leo” Tolstoy, and the web-series she is currently making with some of her best friends; a modern version of Leo’s own Anna Karenina, cleverly named Unhappy Families. And, for a teen who is somewhat living in an unhappy family of her own, creating her web-series is a bit of an escape. Her parents love her, but there's so much happening around her that she’s almost lost in the shuffle of it all. Tash's sister Klaudie is going to Vanderbilt in the fall. Tash wants to apply to college, but she knows that she can't afford the prestigious Vanderbilt if she doesn't have the money. She wants to film her web-series, and she's happy to, but the slow viewership doesn't really allow her to pay the bills and work toward her dreams. Because Tash's web-series has gone viral. Her fans are eating up the episodes almost as fast as they're released, and due to her new-found popularity, Tash has some really important and tough decisions to make regarding her web series and her life at home. TASH HEARTS TOLSTOY is an absolutely perfect book for me. From the second I heard about it, I couldn't stop thinking about it. 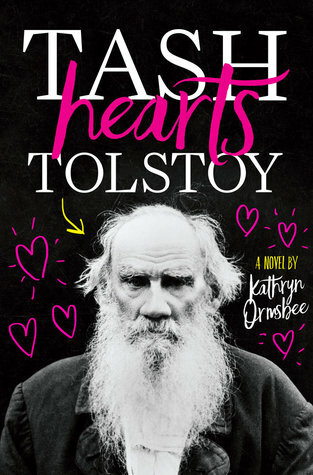 TASH HEARTS TOLSTOY follows a teenager named Tash, who loves to write scripts, and loves to read Tolstoy's most famous work. As I was reading the book, I kept talking to my friend about it, and we couldn't believe that Natasha and I were not the same person. (We are.) Tash and I have some extremely similar struggles, and the way Tash spoke about what was happening her life and how she handled the situations she found herself in hit close to home, but in the best way possible. This book has a grasp on my heart, and my heart has a grasp on it too. I loved this book so much I just had to have a "photo-shoot" for it, and look at how pretty it is against the flowers! The synopsis pitches this book as more of a contemporary romance than I actually believe it is. Because for me, this book wasn't about whether or not Tash would be able to have a relationship with Thom. This book wasn't about how her fame helped her to be noticed by someone (spoiler alert, it didn't). This book wasn't about love itself. It was about Tash, and what her heart was calling her to do, whether or not that even involved romance to begin with. There are so many other things happening in Natasha's life, that to simply call this story a "romance only" doesn't do it justice at all. Her sister is moving away to college in the fall, and Natasha has conflicting feelings about that, along with doubts about college for herself. She works with her friends and almost family on a web-series which can sometimes lead to more hurt than help itself; and wrapping that project up means that she'll have to find a new endeavor to busy herself with soon. On top of all of that, there's the possibility that her friends (and her new-found friend Thom) still don't understand her sexuality. Natasha is asexual, and to see that word on the pages of a book like this even to begin with meant more to me than I could ever say. Asexuality is not something that I have ever seen discussed so explicitly and with such care than I have in this book. Asexuality is discussed and talked about in a positive way, and put into Natasha’s character well. She's a fully developed character and a person with interests and dreams and desires, and as readers, we get to learn about those too. Her story isn't just about her being ace (asexual). Being ace is a part of who she is, but it's not the only part of Natasha that we see. She's not just an asexual girl. She's a girl who likes to sit in front of her camera and try new types of tea while talking about some of her favorite books. She's a girl who is still trying to find her place in the world. She's a girl who wants nothing but success for her and her cast-mates. She's a girl that wants to be happy and make everyone else happy along with her, and she just happens to be asexual. And perhaps the most important part, asexuality isn't treated like a label. It labels what her sexual orientation is, but it's not a label in a negative sense. It's not a word that's just thrown in and mentioned once and that's that. According to Kay’s review on Goodreads, the word “asexual” is in the book eleven times, and each time that word is included, it’s explained (as it relates to what is occurring in the book) and discussed and represented in a fantastic way. Writing a story liked this helped me to connect with Natasha over more than her sexual orientation. She's a person first, and the story and plot of the book treat her like such. Her sexuality is sometimes a point of conflict in the book (some of the discussions about it turn sour, but most of the characters learn from and apologize for their mistakes), but that is part of what made the book relatable to the present issues of today. Asexuality is still not completely accepted, and it's a point that is brought up and addressed well in the book too. And, speaking of other characters, the side-characters in the story, I didn't really feel were side characters. In fact, they were developed so well that if Kathryn Ormsbee wanted to write a book about each of them individually, she could do it. This book is about a cast of characters, and I felt, even though I didn't get to see them much, that I still knew a lot about Jay and George and Serena, even though we really only get to see them while they are shooting the web-series. The plot itself moved quickly. At some points, there was a lot happening in the book (which to me, reflected the day to day life of a teenager), but it was never too much to the point where I was confused with what was happening. Natasha's web-series picks up just like that, and she's thrust into dealing with problems she thought she had at least a little more time to prepare for. But, even as her web-series picked up fame, the story focused on the people, and I really enjoyed that. Fame isn't who a person is, and as Natasha mentions in the book, star-idolization isn't something I really understand. I was happy to, especially as Natasha’s fame picked up, not lose the sense of who she was too. Reading Natasha's story and speaking with her was a lot like speaking to a friend. I love this book more than Tash hearts Tolstoy himself. Anyone who loves to read about YouTubers, filmmaking, web-series production, and even about a girl who loves Tolstoy, this book is for you. I'd definitely recommend it to anyone on the asexual spectrum too. As Leo Tolstoy himself would say, “If you want to be happy, be.”...and maybe read TASH HEARTS TOLSTOY too. I'm sure Tash will love you for reading her story (and for seeing just a little bit of Unhappy Families too), just, maybe not as much as she loves Tolstoy.